CHERRY Cummins will set off for a 400km horse ride on Monday, potentially clinching a record for the smallest-ever steed to finish. The 21-year-old Clontarf resident will compete over five days in the Shahzada, a marathon endurance riding event held in Yengo National Park, west of Wyong. She will be riding Winter Hill Alice, a 12-year-old arabian pony measuring 13.2 hands, or 138cm tall. The South West Endurance team triumphed again – for the second year running – at the Inter Regional competition held at the Ridgeway Barbury Castle Challenge two-day endurance meeting last weekend. There were six teams competing and the South West won with 46 points, the Eastern Region team were second with 61 and the team from the Heart of England were third with 71. Most of the 14 strong team of horses and riders travelled up to Wiltshire on Friday loaded down with full wet weather gear, rugs and tents only to find that Wiltshire was having a heat wave. So bad was the congestion on the A30 and the M5 that a journey that usually takes around four hours took up to eight. Fortunately all the horses stood the journey well, including several who had never been away from home overnight or been corralled on a hillside with dozens of other horses before. Barbury Castle is one of the largest endurance rides on the Endurance GB calendar and there were a total of 28 classes, including a 126km 2* FEI ER and two FEI 1* 80km ERs. The Inter Regional competition, with six teams competing, took place over the two days, with competitors entered in a mix of classes ranging from a 100km ER to a 32km novice. As the start time approached, 153 eager horses and riders representing 40 countries lined up, and as the clock reached 7am there was a cavalry charge as those at the front set off at a gallop. The sun rose on a clear morning at Euston Park, near Thetford, on Saturday 25th August, as horses were led from their stables, tacked up and prepared for the gruelling 160km Longines FEI CEI 4* World Endurance Championships 2012. As the start time approached, 153 eager horses and riders representing 40 countries lined up, and as the clock reached 7am there was a cavalry charge as those at the front set off at a gallop. Endurance is a competition to test the competitor’s ability to safely manage the stamina and fitness of the horse over an endurance course in a competition against the track, the distance, the climate, the terrain and the clock. Diligent application of skill together with a caring, knowledgeable attitude by the rider is vital to be successful, and those setting out today would need every ounce of experience as well as a portion of luck to get to the end. The average speed at World Championship level is expected to be 20kph to be in medal contention, which means keeping up a good canter for most of the 160km or 100 miles. A good pace was set from the outset, with riders from the Arab nations setting the pace. The reigning World Champion, Maria Alvarez Ponton of Spain, riding her popular 17 year old horse, Nobby, was in the leading group along with riders from the UAE including HH Sheikh Mohammed bin Rashid Al Maktoum. Of the British contingent, Annette Masterson riding El Sabio, and Alice Beet riding Adara Sauveterre both got off to a good start. Lesley-Ann Parker riding Velvet Echo, Catriona Moon and Leila, Tricia Hirst and Majin des Pins and Chris Yeoman with LM Crazy Girl preferred to stay out of the mêlée and with 160km to go, a steadier start would prove a wise move. The layout at Euston Park enables the course to be set out as a series of loops, with a central vet gate located at the main venue, close to the start/finish line, providing excellent viewing for spectators. The leaders came back into view at 8.30am, and to everyone’s delight, the first into vet gate 1 was Maria Alvarez Ponton with Nobby, having completed the first loop of 38km at an average of 24.39km per hour. On arrival at the vet gate, the support crew get to work to cool the horse and bring the heart rate down to 64 bpm or below as quickly as possible. The horse must be presented for veterinary inspection to check pulse, soundness and metabolics. There is then a compulsory stop of 30 minutes for rest and refreshment before they can depart on the next loop. The top horses have a remarkable recovery rate and at vet gate 1 they were presenting to the vet in less than 2 minutes. News soon filtered back of the retirement of British individual rider, Catriona Moon riding Leila, out on the first loop due to lameness. This was devastating for Catriona but was a stark reminder that this flat course was extremely technical with sharp turns and variable going that could be sandy then stony then soft. The first British rider into vet gate 1 was Annette Masterson with El Sabio, coming in 12th making an average speed of 23.38km per hour. Alice Beet and Adara Sauveterre came in 46th, making a speed of 20.36km per hour. Chris Yeoman and Tricia Hirst both made a speed of over 18kph and Lesley-Ann Parker was just behind. Vet gate 1 is hectic as not too much time separates the competitors. After their compulsory 30 minutes, riders queued to get out on the second loop of 29km. There was disappointment for Lesley-Ann as she realised that her mare, Velvet Echo, has stiffened up during the stop and the decision was taken not to continue. After the sunshine of the early morning, a heavy downpour had spectators rushing for cover while competitors battled the elements on course. The rain soon passed and the first riders started to arrive at vet gate 2 at around 10.30am. First back was HE Sheikh Rashid Dalmook Al Maktoum, followed by HH Sheikh Mohammed bin Rashid Al Maktoum. Maria and Nobby had slipped back to 4th but were still averaging 23.21kph. Annette Masterson and El Sabio were going strong in 13th, and Alice Beet and Adara were holding a good position in 57th. Tricia Hirst and Madjin des Pins, and Chris Yeoman and LM Crazy Girl, had picked up the pace on the second loop and came into vet gate 2 looking good, but there was disappointment for Chris when LM Crazy Girl failed to pass the veterinary inspection on lameness. “There were some very stony bits on that loop and she must have just trodden on something or knocked herself. There was nothing to see. We were going so well. I am gutted”, said Chris later. Loop 3 was 30km and saw competitors cross the picturesque water crossing twice; a magnet for photographers, as well as being a useful spot to allow horses to take an extra drink. On each loop there are several designated crewing points where horses are “sloshed” with water to cool them and offered a drink and riders can also pick up refreshment - the crew often run alongside the horses throwing water onto them to minimise the time that they are delayed. The leaders were back at vet gate 3 by 12.35, and HE Sheikh Rashid Dalmook Al Maktoum was still leading for the UAE, followed by two Spanish riders, including Maria and Nobby in 3rd. Annette and El Sabio had been going well but sadly they vetted out at gate 3 on metabolics. The organisers expected a high attrition rate this is renowned as a tough course and the veterinary inspections are stringent. “This is the World Championships and to be competitive we need to be making these speeds. It is what we have trained for, so it is very disappointing for Annette and sadly also the end of our team chances”, said team chef d’equipe, Annabelle Schofield. Alice and Adara were maintaining a good, consistent pace, completing loop 3 at 20.38kph and climbing to 42nd place. Tricia was also keeping up a strong pace at 20.89kph and now in 55th postion. The 4th and 5th loop of 20km and 23km saw Alice and Tricia claiming yet more places and vetting through well, despite more torrential rain. They set out from vet gate 5 on the 6th and final loop of 20km at around 5.30pm. The crowds gathered to give HH Sheikh Mohammed Bin Rashid Al Maktoum a rapturous welcome as he rode a strong finish to cross the line first riding the 12 year old chestnut gelding Madji du Pont, with the top 3 places all going to riders from the UAE. The final vet inspection confirmed his victory and he became the World Endurance Champion. He completed the 160km at an average speed of 22.82kph, riding the final loop at 27.6kph to complete the course in 7 hours and 45 seconds. A violent storm struck and torrential rain fell as many riders were still on course, but hardy spectators remained to cheer home the British riders in an emotional finish; Tricia Hirst and her 12 year old grey gelding, Madjins des Pins, in 15th place, completing the final loop at 22.63kph, and Alice Beet, with the 16 year old grey mare, Adara Sauveterre, in 25th place, completing on an average of 19.34kph. “The hail on the last loop was unbelievable and the going had become really slippery. Adara slipped and nearly came down once, and it did slow us down a bit, but we came home safe and it was not worth the risk to go any faster. Adara was very consistent throughout the race, maintaining consistent loop times and she presented [at the vet gates] very fast as her heart rate was excellent. The next morning she was absolutely fine and she had lost no condition. Our average speed was our best time ever”, explained Alice. The powerful thunderstorm caused a dramatic conclusion to the event in the early evening. The top 52 individuals and top four teams had already finished and the medals had been decided, but some of the slower competitors had still not started out on the sixth and final loop. The inclement weather meant that there were concerns for the health and safety of horses, riders and everyone else involved due to the thunder, fork-lightning and torrential rain that suddenly descended. As a result, the distance was reduced to allow those combinations still on the latter stages of the course to finish at vet gate five and to be classified according to timings on the shortened distance. There were mixed results for the four member Australian team at the 2012 World Endurance Championships which were held at Euston Park (GBR) on Saturday. In the Australian camp the day belonged to 17 year old Alexandra Toft and her nine year old mare Emily Jones te, which were the sole Australian combination to complete the gruelling 160 kilometre, six phase event in 52nd position. The combination got caught in a fierce thunderstorm towards the end of the race which later caused the event to be abandoned. Alexandra’s mother, Penny Toft (Travina), a three time representative at this level, made the decision to retire from the race at the end of the third phase, citing tiredness as the reason. Australia’s two remaining combinations Norbert Radny (West Coast Acharon) and Talea Hasko-Stewart (Blake’s Heaven Bombora) were also unfortunate not to make it to the finish line. Norbert fell from his horse mid-way through the event while Talea’s horse was ruled to be lame at the end of the first phase. Just 73 of the 147 horse and rider combinations which started the event went on to finish. “This just proves flat ain’t always easy,” Talea said on her Facebook page the day following the event. “There was a mixture of disappointment, relief and ignited dreams in our camp today. Bombora seems to be fully recovered from his mild tie up, for which we're very grateful,” she added. Competitors from the United Arab Emirates (UAE) claimed team gold and all three individual medals. We have the selection Binomials who will attend the next round of the European Championship Junior Raid 2012. Good luck to our riders selected for the European Championships Raid 2012, to achieve great successes for the glory of our Endurance Equestrian. 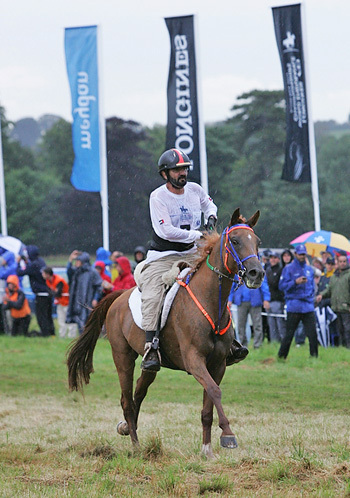 BAHRAIN'S Royal Endurance Team yesterday endured a heart-breaking experience at the FEI World Endurance Horse Ride Championships 2012 at Euston Park near Thetford in the UK. The Bahraini team made a disheartening start as team captain Shaikh Nasser bin Hamad Al Khalifa and team member Ahmed Abdulla were out by the first stage. Shaikh Nasser, the Supreme Council for Youth and Sports chairman and president of the Bahrain Olympic Committee, had to withdraw from the race after his horse Picaflor was injured and failed to pass the veterinary examination at check point. On the other hand, Abdulla, another prominent Bahraini rider, was injured during the first stage of the championship while Yaqoub Al Hammadi and Abdulrahman Al Saad were also out after the third and fourth stages, respectively. This left the squad with only three members - Al Khalidiya Stable skipper Shaikh Khalid bin Hamad Al Khalifa, Jaffer Mirza and Abdulrahman Al Zayed - which ended their chances of a podium finish in the team category. The race started with the six-member Bahraini team lined up with some of the world's best endurance riders competing over six stages. There were 153 men and women riders from 44 countries competing in the championship. Participants came from Finland, Brazil, Canada, Chile, Colombia, Costa Rica, Czech Republic, Australia, Austria, Belgium,Denmark, Ecuador, Estonia, France, Germany, Great Britain, Italy, Guatemala, Hungary, Ireland, Algeria, Argentina, the US, Oman, Pakistan, Poland, Portugal, Qatar, Russia, Slovakia, South Africa, Spain, Sweden Switzerland, Holland, Japan, Lebanon, Lithuania, Malaysia, New Zealand, Norway and Uruguay. The ride, which was over 160 kms, featured 38 kms for the first stage, followed by 29 kms for the second. The third stage was over 30 kms, the fourth covered 20 kms, 23 kms for the fifth while the sixth and concluding stage was over 20 kms. Shaikh Nasser's squad came to the UK hoping to win a podium finish after a two-month training camp in Europe, where they had participated in several endurance rides. Meanwhile, UAE's Shaikh Mohammed bin Rashid Al Maktoum picked up what seemed to be a well-deserved victory in the singles event on Madji Du Pont. Shaikh Mohammed completed the sixth and final stage on top in 43 minutes and 29 seconds, with a 22-km per hour average speed. The UAE riders stamped authority as Shaikh Rashid bin Dalmook Al Maktoum and Ali Al Jahouri were second and third, respectively. Shaikh Mohammed, the Prime Minister and Vice-President of the UAE and ruler of Dubai, also led his squad to retain the world team title for the third time in succession. The remaining members of the UAE team were Shaikh Hamdan bin Mohammed Al Maktoum and Shaikh Majid bin Mohammed Al Khalifa, sons of Shaikh Mohammed, and Ahmad Belqaizi. Shaikh Nasser, along with Shaikh Khalid and other Bahrain riders, congratulated Shaikh Mohammed as well as other members of the UAE team on their double victory following the awarding ceremony. His Majesty King Hamad late last night send a cable congratulating Shaikh Mohammed on winning the FIA World Endurance Horse Ride Championship. His Majesty also congratulated the UAE team for retaining the team title for the third time in succession. Abu Dhabi: His Highness Shaikh Mohammad Bin Rashid Al Maktoum, Vice-President and Prime Minister of the UAE and Ruler of Dubai, secured a historic double in the Longines FEI World Endurance Championships in the UK Saturday. He won the individual gold medal and also led the UAE squad to the team gold at the event, which was held at Euston Hall near Thetford, Suffolk. Riding 12-year-old Madji Du Pont, Shaikh Mohammad galloped to the finish to lead home a 1-2-3 finish of the individual medals, with Shaikh Rashid Dalmook Al Maktoum winning the silver and Ali Khalfan Al Jahouri the bronze. The weekend’s World Endurance Championships at Euston Park have been described as a showcase for the sport, with FEI first vice-president John McEwen declaring it a “wonderful sporting occasion”. The race was won by Sheikh Mohammed Bin Rashid Al Maktoum riding Madji Du Pont, in a ride time of 7hr and 45sec at an average speed of 22.82km/hr. The first three riders home were all from the United Arab Emirates which also won the team competition taking gold ahead of France with Oman emerging as a new force in the sport to take bronze. Speaking after the closing ceremony held at Euston Hall on August 26, John McEwen said: “I have been involved with endurance riding for nearly 30 years and have watched it grow almost from its infancy – yesterday was a showcase for the discipline and a wonderful sporting occasion. I had the privilege of being out on course for two of the loops and seeing the riders and crews at work and the atmosphere was incredible. (MENAFN - Muscat Daily) The Royal Cavalry won the third place at the World Endurance Championships 2012, which was held in UK at Euston Estate. UAE and France won the first and second place respectively in the event which saw 154 riders from 40 countries participating. Twenty-nine teams represented by 116 riders, and 38 riders on an individual level, participated in the race. Riders Mahmood bin Marhoon al Fawri, Hisham bin Saleh al Farsi, Abdullah bin Said al Syabi, Ahmed bin Salem al Hamadani, Sami bin Said al Belushi and Adel bin Said al Belushi competed in the championship along with their horses, Rudlan, Pulco, Penchab Sully,Â Ourour, Maj and Mondalaih, respectively. Brigadier General Abdul Razak bin Abdul Qadir al Shahwarzi, commander of The Royal Cavalry said that he was happy with the achievement and that it was a result of planning and preparation by the team. Elite horses tackled a 160km long course, which consisted of six stages of 38km, 29km, 30km, 20km, 23km and 20km. The Royal Cavalry came 12th in Round One. Fawri completed the round in 1h52min21s, while Hamadani on Ourour finished in 1h52min42s and Farsi took 1h53min27s. In the 29km Round Two, the team came in eighth where Fawri finished in 1h21min12s and Farsi took 45 seconds more to complete the round. Hamdani took 1h22min29s. The Royal Cavalry was fifth in Round Three with Fawri on Rudlan taking 1h22min46s. Farsi on Pulco took 1h25min38s, while Syabi took a minute and nine seconds more. In Round Four too, the team was fifth and Fawri finished first and took 57h32min. Syabi on Penchab Sully took nine seconds more, while Farsi took 59h28min. However, by the end of the fourth round, the horse Ourour was disqualified by the veterinary committee because of a leg injury. Thus, The Royal Cavalry was forced to enter Round five with three horses. It won the third place with Syabi taking 1h12min25s. Farsi took 1h12min42s and Fawri on Rudlan took 1h16min4s. The course for Round Six was characterised by slopes and waterways and The Royal Cavalry maintained its position in this round. Faisal bin Mahboob bin Hassan, director of The Royal Cavalry said the result could not have been achieved without the support the cavalry got from the Royal Court Affairs. Deputy director general of technical affairs at The Royal Cavalry added that the intensive preparation for the championship was a major factor that helped in this achievement. Endurance rides in the United Arab Emirates, a sport loving country, was started under the directives of President His Highness Sheikh Zayed Bin Sultan Al Nahyan. The sport has come a long way since the UAE Equestrian & Racing Federation was established in 1992. The first modern desert ride took place on January 7, 1993. Camels competed against horses in this 40-km pioneering event in the dunes of Dubai and the first 15 places were taken by horses. The UAE Equestrian & Racing Federation has built up a very strong infrastructure to support equestrian sport in general and Endurance in particular. There are three self-sufficient modern Endurance centres or villages in the country and 22 riding clubs and equestrian establishments. Endurance riding has captured the top position in the equestrian sports held in the UAE. Among its strongest supporters are many members from the Royal families of the country and Their Highnesses and Rulers of different Emirates regularly take part in Endurance competitions alongside large numbers of UAE nationals and resident foreign riders and visiting riders from abroad. All Endurance rides are electronically monitored and controlled and receive comprehensive media coverage. The UAE is working closely with several other countries in globally developing Endurance. Over the last decade several remarkable achievements have been made by the Endurance sport and the UAE riders. A brief description is given below. The first National Endurance Riding Rules were established in 1995. The period 1995-1998 saw long-distance point-to-point Endurance rides in the UAE. For the first time the UAE riders participated in the 1996 World Endurance Championship in Kansas, USA. In 1998, for the first time the UAE hosted the World Endurance Championship which attracted a record 162 competitors out of which 78 completed the 160-km ride. This record number of participants gained an entry into the Guinness World Records as “the First Equestrian Federation to enter Guinness World Records as the organiser of the Biggest Equestrian World Endurance Championship 1998.” For the first time, time control was fully computerised and the riders carried plastic swipe cards to register their arrival after each phase of the ride. The world’s First Preferred Endurance Ride was held in 1999 in the UAE which is an annual feature and has been renamed FEI/UAE World Cup Endurance. In late 2002, The Al Wathba Endurance Village in Abu Dhabi built in 2000 was refurbished and The President’s Cup (160km) and the National Day Cup (120km) rides are annual important events here. Young UAE rider Sheikh Ahmed Bin Mohammed Al Maktoum became the youngest rider in history and also the first man to win the coveted FEI World Cup Endurance Championship at the 2002 World Equestrian Games in Spain. The UAE has been elected Chairman of the Endurance Committee of Asian Equestrian Federations.
. Formulating the National Rules and regular updates.
. Maintaining an Endurance Registry, mainly a record of riders and horses right from the advent of sport in the United Arab Emirates.
. UAE Endurance licensing of riders and trainers and registration of horses.
. Interaction with FEI, AEF and national federations and foreign Endurance organisers and well-known Endurance persons in Endurance related matters.
. Interaction with UAE Endurance organisers for planning rides, developing the Endurance calendar, Endurance village infrastructure and preparation of Endurance trail, selection of officials and overall technical management of most competitions and qualifications rides in the UAE.
. Complete liaison with FEI in preparing the Endurance calendar, the draft schedules for the FEI rides and sending the results. Total detailed online registration of riders and horses with FEI.
. Technical control and advisory role in rides in the UAE.
. Maintaining a proper protocol and observance of all international norms and regulations and ensuring that the competitions are held according to the rules.
. Maintaining a National Register and conducting Endurance rides exclusively for private national owners.
. Coordinating the functions of all officials working at the ride.
. Interaction with clubs, licensed persons in the running of day-to-day Endurance in the UAE.
. Handling and scrutiny of all entries for the rides and ensuring that the rules and conditions are abided by.
. Checking out Endurance routes, checking the facilities and amenities of the four Endurance villages. Inspection of Endurance trials and handling of all complaints and reports. Arbitration and settlement of disputes on the ride day itself.
. Issuing Endurance information regularly to all stables and riders concerning national and international rides and other Endurance matters.
. Complete Endurance invoicing of all FEI registrations, Federation licenses and individual entry fees of rides organised in Abu Dhabi.
. Active participation both as FEI officials and at the national level to ensure that all regulations and protocols are observed.
. Inspection of prospective riding clubs in the UAE and assessment of their capabilities.
. It is also one of the duties of the National Federation to send eligible national riders to participate in international rides all over the world. The NF scrutinises and ensures that all necessary rules have been observed and that our riders and horses are accepted, ensuring their smooth participation in the event. Newmarket, UK – Saturday, August 25 started out pleasant at Euston Park, but throughout the day the weather deteriorated into heavy downpours and severe thunderstorms. Due to the extreme weather, officials had to call the race off for the safety of the horses and riders. In an unusual finish to an endurance race, several riders were placed based on the position they were in at the time that the race was called, but the majority of the riders finished the sixth and final loop. The U.S. Team made quite a showing against stiff competition finishing in fourth place with a combined time of 24:45:00. Valerie Kanavy (Fort Valley, VA) was the first member of the team to finish with Reach For The Gold in 20th place with a time of 08:00:06. Jeremy Reynolds (Dunnellon, FL) and A Kutt Above were right behind her, finishing in 21st place with a time of 08:00:09. Heather Reynolds (Dunnellon, FL) and Riverwatch finished in 36th place with a time of 08:44:45. John Crandell III (West River, MD) was unable to finish the race when Heraldic did not pass the mandatory re-check at Vet Check 5. Margaret “Meg” Sleeper (Frenchtown, NJ) and Syrocco Reveille had an amazing day at Euston Park. Sleeper was the first U.S. rider to cross the finish line, finishing in 11th place with a time of 07:49:11. The pair had an average speed of 20.46 kph. With a time of 21:22:37, the United Arab Emirates (UAE) claimed Team Gold as well as sweeping all of the Individual medals. France won Team Silver with a time of 23:24:47 and Oman won Team Bronze with a time of 23:55:46. HH Sheikh Mohammad bin Rashid Al Maktoum (UAE) rode Madji du Pont to Individual Gold with a time of 7:00:45 and an average speed of 22.82 kph, followed closely behind by UAE teammates HE Sheikh Rashid Dalmook Al Maktoum on Yamamah (07:01:04) and Ali Khalfan Al Jahouri on Vendaval (07:01:04). The 2010 Alltech FEI World Equestrian Games Gold medalist Maria Alvarez Ponton of Spain finished fourth with her WEG partner Nobby. The Best Conditioned Horse was Ikland ridden by Alex Luque Moral of Spain. The pair finished fifth individually. It is with great sadness that we announce that Karrimh, owned and ridden by Donna Oudshoorn of The Netherlands, was put down as a result of an accident while competing at the FEI World Endurance Championships at Euston Park, Suffolk, UK on Saturday 25th August 2012. Karrimh, an 18-year-old gelding, stumbled and fell while on loop one of the 160km championship course. HH Sheikh Mohammed Bin Rashid Al Maktoum became the World Endurance Champion after victory in the Longines FEI World Endurance Championship 2012 held at Euston Park near Thetford, Suffolk, UK (25th August 2012). Riding Madji Du Pont, Sheikh Mohammed completed the 160km Championship with a strong finish at an average speed of 22.82km/hr. He rode the final 20km loop at 27.6km/hr to finish ahead of his countrymen HE Sheikh Rashid Dalmook Al Maktoum (Yamamah) and Ali Ahalfan Al Jahouri (Vendaval). Former World Champion, Spain’s Maria Alvarez Ponton came fourth with Nobby after a fine performance from the evergreen 17-year-old victor in Kentucky in 2010 and Malaysia in 2012. It was a convincing win by the UAE riders viewed as the strongest in the sport. The team of HH Sheikh Mohammed bin Rashid Al Maktoum, HE Sheikh Rashid Dalmook Al Maktoum and HE Sheikh Majid bin Mohammed Al Maktoum also won the World Championship team competition in style completing a full two hours ahead of France with Oman in third, the USA in fourth and Belgium in fifth. A world class field of 147 riders lined up for the championships over what was widely viewed as a deceptively tough course which took in a variety of terrain from forest tracks to grassland and sand. Weather conditions which had been forecast as potentially disruptive, held off for the majority of the ride with warm sunshine sending riders off on the trail at the 7am mass start. However, thunderstorms and torrential rain in the later stages of the event forced organisers to take the unprecedented step of halting the event on safety grounds with officials bringing a “formula one motor racing” end to the ride enabling riders to ride into the vetgate ahead of them and enter their horse for a final inspection without completing the full 160km. Speaking after the ride, Sheikh Mohammed told reporters: “I only ever compete because I enjoy taking part in endurance. I do not go out to get a result, I go out to have fun. I do not try to change position but ride my own ride. Commenting on the strong performance of the gold medal winning UAE team, Saeed H Al Tayer, Chef d' Equipe of the UAE, said: "We are proud to be a part of this elite World Championships. “A great deal of training and preparation has guided the team through this technically challenging course and today's weather conditions. The calibre of riders is high and competition fierce but the team has stayed focused throughout the loops and ensured the safety and welfare of the horses at all times. 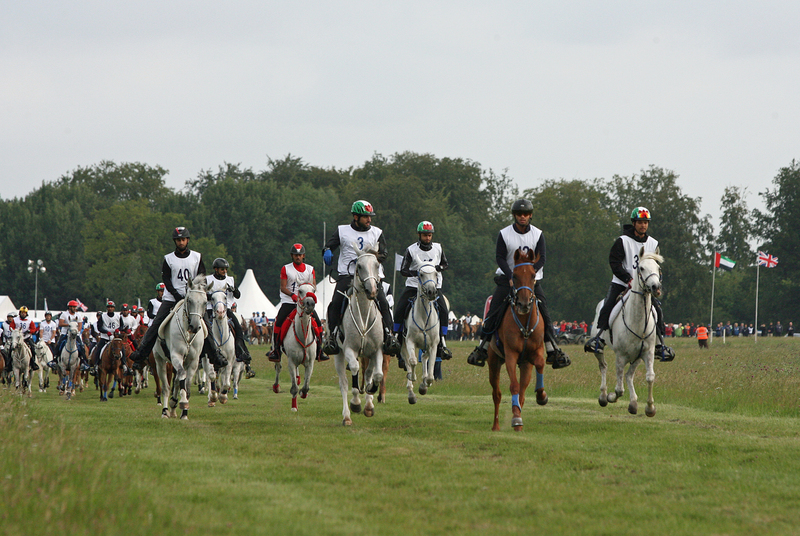 “Euston Park is a beautiful venue and the UAE riders have enjoyed navigating the terrain: forests, rivers and farmland. To have achieved Individual first, second and third is an incredible result for the UAE and we are extremely proud of the riders and crew involved." “I think we have some good horses but the competition is going to be very tough, to earn an individual medal it will be very hard, we hope to be in apposition to get a team medal. “We have the right people and the right team and it requires a lot of strategy but we’re confident. “We have many experience horses and many have done 100 milers, some have won the Tevis Cup. “We’re anxious about the vetting as our horses haven’t come yet! But they have all been checked by our team vet so we are confident we should be fine to pass this section of the race. “We’re really excited about the race tomorrow. I think we have an outstanding team and we’ve set ourselves up to do really well. “I have seen some of the course and I think it is of course a little more challenging than prior world championships, definitely more technical. It is going to require more turns and gate changes. Riders with good balance with their horse will have an advantage. “I’m very excited about tomorrow. It’s a nice venue and the trail is well marked, it has some interesting turns to it too. “From what I have seen of the course it seems soft and nicely footed, although tricky in some parts. The wildlife, venue and scenery are lovely. I am really aiming for a good finish, so we’ll see how the day shakes out. “If it does rain tomorrow, we’ll have to just pay attention to the horse and make sure he is well balanced and doesn’t slip and slide. “The opening ceremony was amazing, probably the best I’ve been to. It was lovely how everyone mingled, it didn’t matter if you were a rider, manager or organiser, it was really inclusive. “The nerves are beginning to build about the vetting this afternoon. Even if you are totally happy with the horse, all it takes is the horse to step one a stone and that ride is over before you’ve even started. “It’s a deceptive course, your first impression is that it is quite easy. But there are a lot of different terrains and different going. So although it’s flat everywhere apart from the Red route, what’s under foot is very deceptive. You can be going over hard stoney stuff one minute but deep sand the next. The river crossings are going to be slippery. There are a lot of tree routes, twists, turns and banks. There are things to be aware of every metre of the 160km. It is going to be a really true test of horsemanship. “For us it is very important to finish - to pass the first inspection and to enjoy taking part in the sport. “At the start of the championships, the pre-ride vetting is going smoothly. We’re amazed at the facility, it is all horse friendly. It is a world championship and there is a lot of activity so the horses seem a little apprehensive about that but it is a very exciting race coming up tomorrow. “The parts of the course we’ve seen so far are really impressive. It’s a true international course - it may be relatively flat but it is pretty technical, so I expect it will produce a true champion. “I was very pleased to pass my vetting this afternoon. I am nervous about tomorrow as I think it will be difficult with so many people starting all at once. I plan to chase the lead but go steady, just behind. “I have only seen the training course, I don’t think the ground is the best so I have to be careful tomorrow. “I haven’t had much time to train as I have two small children, a one and a half and three year old and work full time. So I try to train every second day and the rest he goes in the horse walker. “I qualified in the Swedish championship I came second and got best conditioned. Getting that result does make me confident for tomorrow but I am very nervous of the start. “We are quite confident as we have a lot of horses who have been doing very well recently at big races, including the Europeans and here at Euston Park last year. “Three of our riders are at a world championship for the first time, for two of them it is their first international competition, but everyone is excited and feeling confident. “The course is fast and tricky. Lots of turning and changes from grass to track, it makes it difficult for the horse. You think you can go fast but all the time you have to start and stop. “We’ve been practicing using tracks and making the horses change transitions. Making them learn how to balance on tracks by cantering from grass over tracks and back again. The Longines FEI World Endurance Championships (25th August 2012) will open this evening (Thusday 23rd August 2012) with a lavish opening ceremony in the grounds of Euston Hall near Thetford, Suffolk. A press conference today (23rd August) heard that the event to declare the competition officially open would celebrate the horse with a sensational display. Created by Prisme International, the spectacle will include 3D mapping onto the side of Euston Hall following by a breath taking live show including fifty dancers together with performers and opera singers. Organisers said creator Pierre Markout’s ceremony would also reflect the equestrian spirit of the Championships including a display by Mario Lurashi, one of the world’s leading stunt riders. The multi-layered ceremony will also be lighting up the skies using a choreographed firework display, laser lighting and a hot-air balloon. Ian Williams confirmed that there had been definite entries from 153 horse and rider combinations from 38 nations with 29 teams entered. Technical advisor John Robertson told the conference that the course would be “highly technical”. Mohammed Al Khayat, Commercial Director of Meydan Group LLC said that Meydan together with title sponsor Longines and fellow supporting sponsor Emaar, was delighted to be involved in the Championships. The Duke of Grafton has officially opened the Longines FEI World Endurance Championship 2012 set to be held tomorrow (25th August 2012) at Euston Park near Thetford, Suffolk. Speaking at a lavish opening ceremony held last night at Euston Hall, the Duke welcomed 153 athletes and crews from 38 nations. Around 2000 guests included team members, crews and supporters who were also joined by UK Minister of Sport Hugh Robertson MP. The Duke of Grafton said: “This gathering of 153 of the world’s leading endurance riders from all corners of the globe is the culmination of nearly a decade of development of Euston as a venue for the world’s fastest growing equestrian sport. It has been a hugely enjoyable process and it is a great honour to see you all here. “At that first endurance ride held here in 2005 – there was a considerably smaller field, but nonetheless, it was my late father’s vision that one day, we would host a World Championship. It is sad for myself and family, that he is not here to see that dream realised, but I know that he would have been proud, to welcome you here today. “Euston Hall has been the home of the Dukes of Grafton for more than 300 years. Traditionally renowned for their love of horse racing, the third and fourth Dukes could often be seen in this very parkland admiring the many successful horses they bred and trained. The Euston Estate comprises a rich mixture of woods and arable land and this, together with the generous support of neighbouring landowners, we hope will provide a stunning setting for a memorable sporting occasion. “This wonderful course and spectacular venue would not however be possible without the support of our sponsors and I would like to add my thanks and those of the organizing committee to Longines, Meydan and to Emaar. “I also want to pay tribute to all those who have worked tirelessly since we were awarded the honour of hosting the championships 15 months ago. “It has been a fantastic summer of competitive sport with the European Football Cup and we have just enjoyed 16 days of glorious sporting action at the London 2012 Olympics, thanks in no small part to a huge army of volunteers – the Games Makers. Well we have our own team of Games Makers here in Suffolk, as there will be around 100 volunteers involved over the next few days, and I would like to thank them for their efforts. “Finally to the riders, crews and supporters. To compete for your country at this level takes years of dedication and hard work to develop the special partnership between horse and rider and supreme athleticism to complete that grueling 100 miles in one day. Ian Williams, Director of Non-Olympic Sports for the FEI said: “After so many months of planning, and dedicated hard work, we are now all here at the start of this World Championship. “On behalf of the FEI President, her Royal Highness Princess Haya, we wish everyone an exciting, competitive and above all safe championship. The event will see a star-studded field of riders and horses including three former world champions tackle the 160km (100-mile) championship course in a single day. The 14th running of the championships will see the current holder, Spain’s Maria Alvarez Ponton, attempt to match the USA’s Becky Hart in winning three World titles in succession – a feat first achieved by Hart in 1988, 1990 and 1992 with the great RO Grand Sultan. Meanwhile HH Sheikh Mohammed Bin Rashid Al Maktoum, whose son Sheikh Ahmed won the world individual title in 2002 at the age of just 16 and one of the world’s leading racehorse owners, is also taking part leading a strong UAE defence of its world team title for the third time in succession. A total of 29 teams have entered the championship including the host nation Great Britain who were last on the medal table at the 2000 World Championships in Compiegne, France. Several landowners and farmers have given access to their land to enable the organisers to create a 100-mile route over the Breckland course covering heathland, forest tracks and open farmland. Hundreds of local volunteers will be involved in the event which is expected to draw around 2000 people including participants, crew, officials and spectactors. The opening event was devised by show director Pierre Marcout together with Gilles Ledos and Jean Marc Chandoo of Prisme International. Alongside title sponsor Longines, two Dubai industry giants, Meydan and Emaar Properties are additional supporters of the championships. Definite entries have been announced for the Longines FEI World Endurance Championships. 154 riders from 38 countries are scheduled to cross the starting line on August 25 at Euston Park, Great Britain. A huge international field of 153 riders from 38 countries is set to line up for next week’s Longines FEI World Endurance Championships next week (25th August 2012) at Euston Park near Newmarket, Suffolk. A star-studded field including three former world champions is set to tackle the FEI CEI 4* 160km competition whose title sponsor is Swiss watchmaker Longines. The 14th running of the championships will see Spain’s Maria Alvarez Ponton attempt to match the USA’s Becky Hart in winning three World titles in succession – a feat first achieved by Hart in 1988, 1990 and 1992 with the great RO Grand Sultan. Alvarez will partner her 17-year-old superstar Nobby as the pair attempt to make history. Already unbeaten in four successive championships, with two World and two European titles to their name since 2008, unlike Hart and RO Grand Sultan whose victories came on home ground in the USA and in Europe, Alvarez and Nobby have won over widely differing terrain. Their first victory in 2008 came at the inaugural world championship run in a tropical country which was held after the hours of darkness in Terengganu, Malaysia. They went on to romp home at the Europeans at Assisi in Italy in 2009 and then again over the relatively flat track at the Alltech Kentucky World Equestrian Games in 2010 following this up with an invincible performance over the steep climbs at Florac at the 2011 European Championships. A win at Euston Park would cement the diminutive 148cm-high Nobby’s place as the greatest endurance horse of all time. Fittingly, Becky Hart stages a return to the USA team for the first time for several years as does her compatriot Valerie Kanavy, a double world champion. Meanwhile HH Sheikh Mohammed Bin Rashid Al Maktoum, whose son Sheikh Ahmed won the world individual title in 2002 at the age of just 16, will lead a strong UAE defence of its world team title for the third time in succession having won convincingly in both Kentucky and Terengganu. Alvarez’s winning time of 7hr: 35min.44sec at the Alltech Kentucky World Equestrian Games in 2010 will be a target for the winning rider, while teams will be looking to emulate the UAE’s 2010 winning total ride time of 23hr53min36sec – the fastest yet scored a championship. With around 1000 participants, riders, crew and officials, the championship will have a significant economic impact on the area around Euston Park and the Newmarket area during the build-up and immediately post competition. I'm Carmen Romer-Theunissen, 27 years old and married to Kay Theunissen. I am active since 1995 in the endurance sport, a branch of equestrian sport in which 160 km in one day is made. Since 2003 I make part of the Dutch team. game 19 times from 160 km of spreading, 5 times Dutch champion, european champion 2006 peak. I travel for the sport around the world, am now in 23 countries and have started a total of 134 completed matches well with a total of over 12,000 well driven race kilometers. Of these 28 victories, second place 22 times and 10 times third. The team of horses which have travelled to the UK for the World Endurance Championships are settling into their temporary accommodation at the Riddlesworth Equestrian Centre in Suffolk. The four horses arrived in the UK last Thursday ahead of the World Endurance Championships which take place on 25 August. “All four horses have recovered from the long trip and have been exercised with light rides and hand walks. They are doing good work and in the next few days they will do longer and faster sessions,” said Chef d’Equipe Peter Toft. “The horses have great stables and paddocks and the training trails are excellent – we have a nice marked 20 kilometre loop,” he added. “The grass here is lush and green so although the horses have enjoyed it, we are limiting the grazing,” Toft said. Riders Penny Toft, Talea Haskow-Stewart and Norbert Radney have arrived at camp with Alexandra Toft due to arrive later this week. Chris Yeoman has a very busy few weeks ahead of her. Not only has she been picked to represent GB in the World Endurance Championships at Euston Park, Thetford, with her horse LM Crazy Girl; her other horse LM Greyson has been picked as the fourth reserve horse. This is a fantastic achievement and we are looking forward to seeing how she does! The Neue Schule advice team is travelling down to the Endurance Championships on the 25th August to support Neue Schule stockist Saddle Exchange. If you are going to the Endurance Championships and would like advice on any aspect of bitting please don’t hesitate to come and visit the stand. “My endurance horses have to be light and manoeuvrable at speed and controllable on a start line of anything up to 100 horses so the bit I use is a very important tool that I have and Neue Schule are excellent for a variety of horses with individual issues. Greyson was always strong in the hand and would lean heavily on me on the first loop. I now have him in a Neue Schule Swales bit which has taken the pressure off the poll leaving him lighter in the hand and more responsive to my aids. Pagosa veterinarian Dr. Dwight Hooton of Elk Park Animal Hospital flew to the United Kingdom Wednesday, Aug. 15, where he will serve as team vet for the USA team at the Longines FEI World Endurance Championships at Euston Park, near Newmarket, Suffolk, UK, beginning today. The main event, which takes place Saturday, Aug. 25, is a 100-mile race that must be completed within 18 hours. It is the closest competition to the Olympics in endurance horse riding. If and, as Hooton says, when, endurance riding becomes an Olympic sport, the World Endurance Championships would be the qualifying race. Hooton, who has been practicing in Pagosa Springs for the last four years, will be responsible for the medical care of the U.S. team’s seven horses, six of which will compete among 160 horses from all seven continents. Hooton, who is also the team’s acupuncturist, will begin daily evaluations of the team’s horses as soon as he arrives and will continue to do so up to the day of the race. Seven and one-half to eight hours later, when the top horse/rider teams begin to cross the finish line, Hooton will resume evaluations and apply recovery treatment to the horses before they return to the United States. Organisers of the Longines FEI World Endurance Championships at Euston Park, near Newmarket, Suffolk, UK have released final details of the 160km track that will test up to 150 riders from around 40 countries on 25th August 2012. The route comprises six loops of between 20km and 38km five of which take riders on different routes around the Suffolk countryside covering heathland, forest tracks, river meadows and open farmland all with the support of local landowners, farmers and the Forestry Commission. Appropriately, the field will be following in ancient footsteps as the route crosses the start of the historic 120mile Icknield Way, Britain’s oldest long-distance path. As a boost to horse and rider, at the end of the ride the final stretch takes the field back out over familiar territory with a repeat of the fourth 20km loop. However, course designers Steve Hulse and Gary Honeywill, say the main aim throughout the ride has been to provide interesting and varied terrain that will provide a true championship test. Steve Hulse, a former jockey said: “The route may be flat, but it is deceptively difficult and requires real riding to get it right all the way to the finish. Reflecting the degree of difficulty presented, at the Championship test event in July 2011, there were 21 finishers from 71 starters. Riding Aghaab, which is among his nominated rides for the championship, Sheikh Mohammed bin Rashid Al Maktoum won the FEI CEI*** 160km event in 7hr40min06sec, averaging 20.86km/hr. Reigning world champions, Spain’s Maria Alvarez and Nobby hold the record as the only combination to have claimed two world titles in succession and Spain will be hoping that Ms Alvarez is again among their line-up. The UAE currently holds the team world title. Alvarez’s winning time of 7hr:35min.44sec at the Alltech Kentucky World Equestrian Games in 2010 will be a target for the winning rider at this summer’s World Endurance Championships. The full list of nominated entries for the competition will be published on 14th August 2012. News Raid World Championship 2012. We report on the next Raid World Championship 2012, the news, come from the official website of the Spanish Equestrian Federation, where we describe, as much data, full details of the test, and the history of Binomials participants. It note on a new course, the news of the Resistance Equestrian Team this new Federated, head of the world's Raid, we want to be well informed and we have samples of interest in the discipline "No Olympic" but more medals achieved for our country. Next week, specifically on Saturday 25, vie for the 160 miles from the Raid World Championship 2012 in the well known British Euston Park facilities. The discipline of Raid, Continental Championships held in odd years, and unlike others, the World Championships in even years (some, at the premises of the World Equestrian Games, and others in specific sites, coinciding with the years Olympic). This is the case in this year's World Championship '12: Olympic even year and therefore in specific venue. Not surprisingly, the venue that is hosting this Championship is set in the British Isles. The Raid is the equestrian discipline that produces most successful in Spain, so hopes are high, even taking into account the unstoppable drive of the computers in the Arab world. In any case, when a team has been Champion and Champion sub continental, where a team line Champions World Champions and Continental, the expectations are more than justified. Noteworthy among the six components of our delegation, the proper name of Maria Alvarez Ponton and Nobby, current World Champion Single (2008 and 2010) and Single European Champions (2009 and 2011). It so happens that Mary, who in 2010 ran the Championships. World of Kentucky, who won with Nobby, just weeks after giving birth, has recently become a mother. If 2010 was her husband, Jaume Punti, who ran a test preparation with Nobby Nobby this time, at 17, comes not in competition since last year. Alex Luque was World Champion individually in the WEG Aachen 2006. This time again the team with Ikland, a Shagya 8 years with which he won last year in Bratislava and Lluçanes. It's unusual origin, may be worth clarifying that the Shagya is named after a stallion born in Syria in 1810, originally tremendously discussed (apparently Arabic, but not 100%). In any case Shagya was developed in the Austro-Hungarian empire in the nineteenth century, and its origins lead us to the Stud Books of Babolna and Tropolcianky. Jaume Punti, individual runner Lezirias Europe '07 run, finally, Quram Ulm, an Arab of 8 years he ran this year in the 160 kilometers from Dubai, where they were fifth against all Arab armies. Maria Uriarte, fifth this year in the 160 miles of Castelsagrat, will compete in this competition mate, Arabic Oliver TB 11 years. Monica Comas, participant and in several World Championships for young horses, will be released "with the greatest" in Esuton Park, riding Gaeia, an Arabian mare 9 years, with which this year was 7 th in the 160 miles of Casarrubios. Finally, Oriol Casals repeated, with the Arab Zarha de Vilaformiu 10 years, with the same partner as last year remain sub European Team Championship and fifth individually. All of them, on Saturday 25, take the exit to 06.30 am to meet the 160 kilometer run, for those who are granted a maximum of 11 hours and 26 minutes. Rounding out the Spanish delegation Ignasi Casas (Team Leader), Fabrizio Pochesci (veterinarian), Marco Villamor (farrier), Daniel Fenaux (Assistant Team Manager) and Anna Maxenchs (assistant). " PARIS — Horse riders of the Royal Cavalry qualified for the World Endurance Cup 2012 to be held on August 25 in Britain with participation of 143 riders from forty countries around the world. The Royal Court Affairs (RCA) honoured the endurance team at the training camp in the French city of Fontainebleau to enable them to achieve better results in the World Cup. During the training camp, the riders participated in many international races organised by the International Federation for Equestrian in France and achieved good results. The training programme is continuing in accordance with the plan by the technical team for riders and horses which will participate in the finals. There will be large screens and loos for anyone who wants to see the ceremony and get involved in the atmosphere. Unfortunately there is physically not enough room to accommodate everyone round the area and those ticketed seats are reserved for competitors and official guests. The logistics of accommodating an unknown number of visitors are proving very difficult for the organisers and I do hope that you can all understand the problems. Until the final declarations of entry are made it is impossible to estimate the number of competitors and all their entourages! Janah Management Ltd is determined that no-one should feel left out and that provision is being made to allow everyone to enjoy the occasion as far as possible. As Chairman I do urge you all to support this fantastic event - we have thoroughly enjoyed the Olympics - now we have our own version just for Endurance! There will be hiccups and disappointments - but please do come with a positive attitude! Everyone is working really hard to make this a really enjoyable event - we have a fantastic Team representing Endurance GB - we just need your support! Any suggestions for a more suitable name will be welcomed - "enclave" means an area or territory surrounded by another territory - seemed appropriate!!!!!!!!!! I just arrived news of the Binomials Selected for World Raid in Euston Park in Britain. Raid our National Coach, I do get this working with Binomials Selected to the test. "Hi Gabriel, I pass the list of those selected for the World Cup. will leave on Saturday 18 with the truck to arrive on Monday 20 to Euston Park. I can not say anything more because I have barely time for anything. Once you know what the junior and I'll pass. Thank you very much to our coach Ignasi Casas, by the courtesy to send me news of our selected pairs. DORSET’S Nikki Malcolm will represent Great Britain at this year’s Longines World Endurance Championships in Suffolk. The Whitcombe rider booked her place in the squad following a final performance trial at Wolverhampton racecourse. Riding Khartoum With A K, Malcolm will be joined at the Aug-ust 25 event by Alice Beet, Tricia Hirst, Annette Masterson, Lesley-Ann Parker and Christine Yeoman. Chairman of selectors Di Latham said: “We are confident that we have a strong team, with a vast amount of experience at International and Championship level, capable of competing against the best in the world and securing a result to make Great Britain proud of our athletes. BAHRAIN's Jaffar Mirza yesterday clinched the World Endurance Horse Ride Championship for eight-year-old horse category in Babolna, Hungary. The Royal Endurance Team member steered Yosko to victory in this challenging 120km ride on the second day of the event, which saw participants from Slovakia, France, Germany, Italy, Bulgaria, Czech Republic and hosts Hungary. It was sweet victory for the Bahraini team and their captain Shaikh Nasser bin Hamad Al Khallifa, who clinched the seven-year-old horse category ride held at the same venue on Friday. The Royal Team are in the final phase of preparations for the FIA World Championship that will take place on August 25 at Euston Park near Thetford in the UK. Yesterday's event was the last event for the Bahraini team, who have been camping in Europe for the last two months, during which they participated in several rides. The ride comprised four stages, with the first stage featuring 34kms. The second stage was over 31km, the third 34km while the fourth and final stage was over 21km. Mirza completed the ride with a total time of five hours, 44 minutes and 15 seconds, and with 21km per hour speed average. The remaining team members in the fray were Raed Mahmood, who finished eighth overall, besides Shaikh Mohammed bin Mubarak Al Khalifa, who was forced to withdraw in the third stage after his horse suffered an injury. Mirza was congratulated after the ride by Shaikh Nasser and Bahrain Royal Equestrian and Endurance Federation president Shaikh Khalid bin Hamad Al Khalifa. Shaikh Nasser, the Supreme Council for Youth and Sports chairman and Bahrain Olympic Committee president, said the Bahrain team have already achieved the aspired goal by competing with a group of prominent riders in this two-day championship. He noted that Bahrain riders have improved on their skills and overall performance by taking part in a number of endurance rides over the past two months in Europe. Shaikh Nasser added that his team's continued achievements came as a result of the riders' efforts along with members of the administrative team, who all worked as one family to accomplish these gains for the Kingdom of Bahrain, in general, and to endurance in specific. Shaikh Nasser added that the team was keen to take advantage of yesterday's ride ahead of the world championships, which will be over 160km. August 6th is the deadline for nominated entries for the European Endurance Championship for Young Riders & Juniors to take place on 8-9 September at Mont-le-Soie, Belgium. while definite entries have to be forwarded on the August 29th. We expect 80 riders from 20 different European countries. The Championship is not open to non-European riders. On the days after -sunday 9th September- it will be the Veterans' Worldcup. We expect a good number of riders. This CEI** competition is OPEN to non-veterans. There will be a ranking for Veterans and an Open ranking. Individual medalists of the Junior European Championship medalists and of the Mundial for Veterans will receive a helmet UVEX FP3 ACTIVE PLUS (value € 400) painted in the colors of their medals (gold - silver - bronze). The winner of the junior championship (09/08/2012) will also receive a saddle WINTEC / BATES worth € 1,000 while the winner of the World Veterans (09/09/2012) will receive, in addition to cash prizes, a pallet of wood pellets HORSE COVER to cover the needs of a horse litter for one year (value € 1,000). UVEX helmets and saddle WINTEC / BATES are offered by the Belgian importer of these products, the company AKTIS. Wood pellets HORSE COVER are offered by the Belgian manufacturer of this revolutionary product, the company RECYBOIS. The various winners of these races (and CEI2* and 1*, 09/09) and championships will also receive the stirups REFLEX and PREMIUM PERFORMANCE PROFILE of the Belgian firm COMPOSITI (value € 30). Note that the riders of the Belgian national teams, both junior and senior, are themselves equipped with helmets UVEX FP3 ACTIVE PLUS, REFLEX COMPOSITI stir ups while their horses sleep on HORSE COVER. All participants will be met on arrival, as the tradition is at the Mont le Soie, with a gift package of Belgian local beer LA CHOUFFE (4 bottles + 1 glass ). LANGKAWI, Aug 9 (Bernama) -- Junior rider Muhammad Ziyad Muhammad Hamzah has been chosen to represent Malaysia at the World Endurance Championship 2012 in Euston Park, Thetford, England on Aug 25. At 16, Muhammad Ziyad will be the youngest rider to represent the country along with six senior riders in the championship. He had been training hard for the championship for the past two years. "I believe I could complete the 190 km ride, but I can't predict the position," he told reporters here Thursday. Ranked 13th among juniors, Muhammad Ziyad of Sekolah Menengah Tunku Putra had performed well within and outside the county. Endurance rides of up to 160 kilometres are a family sport for the Smith Family. Murray and Andrea Smith and their daughters Georgia, 15, and Brigitte, 12, are from the upper Kawhatau Valley towards the Ruahine Ranges from Mangaweka. There they farm 566 hectares of hill country running beef and sheep. "Our riding must fit in around the stock and farm work but we certainly endeavour to make it work if we can," said Mr Smith. Regular farm work also keeps the Arab horses fit for their long 160km rides. Both girls have ridden from tiny with both longing to start endurance rides long before their parents felt they were ready. "We have never made them ride; in fact it was hard for them to wait when we felt they were not ready," said Andrea. Murray was keen to ride while Andrea was a little more hesitant with two young daughters. However, after time with a pony club, Georgia had her first ride at age seven while Brigitte was just five. Both girls are also keen show jumpers, but this has to fit around the endurance riding. The season runs from August to Easter. The sport is very disciplined with a strong emphasis on the health and welfare of both horse and rider. Riders cannot start till age five and although there is a novice system, the speed restriction does not allow the horse or rider to go too fast. "No one can just buy a horse and start," said Mrs Smith. "Both the horse and rider need conditioning..."
The Australian Endurance Team has had another blow to its preparation today, when Ondy (Andrea Laws King) on medical advice has withdrawn from the Australian Endurance Team. Ondy had a nasty fall from her Horse last weekend. We thank her for conducting herself in a professional manner and wish her a speedy recovery. The horses leave Australia with Chef Peter Toft from Melbourne on August 8th. Penny and grooms will leave several days before together with Norbert and Jane, Talea and family. This is a reduced team and certainly not what was planned, however, what we may miss in numbers we will make up with experience, with Penny the veteran of many WC’s , not having missed one since Compeigne in 2000, Alexandra having been a team member in 2009 at Babolna and a groom at WC’s since before she could walk almost, Norbert and Jane experienced the highs and lows at Kentucky 2 years ago and have well and truly got the bug! Talea and family will have to experience all before them. We wish the Team every success, and will try and keep everyone posted. On Behalf of the Australian Endurance Team to contest the 2012 World Endurance Championships, I would like to sincerely thank the Arabian Horse Society of Australia, it’s Board and members for providing each of the five horses with a AHSA team rug. I would like to acknowledge the AHSA’s support to all our teams at World Equestrian Games and World Endurance Championships over the past two decades. Our 2012 team, like most other teams, consists of Australian Arabian Horses and this team will go as teams before representing all that is good about Australian Arabians with their amazing athleticism. Our representative team is a credit to the many Australian breeders who, whilst acknowledging the type and beauty of the Arabian horse, also know Arabians are bred to be ridden. Currently the International component of Endurance in Australia is undergoing considerable reform and the 2012 team is excited to have the honour to represent Australia on the world stage. Profiles of Horses and Riders will be on the Equestrian Australian website shortly. TRAVINA ridden and bred by Penny Toft. Sire Ralvon Amigo S-17258 ( s Milex ) Dam. Traveller.